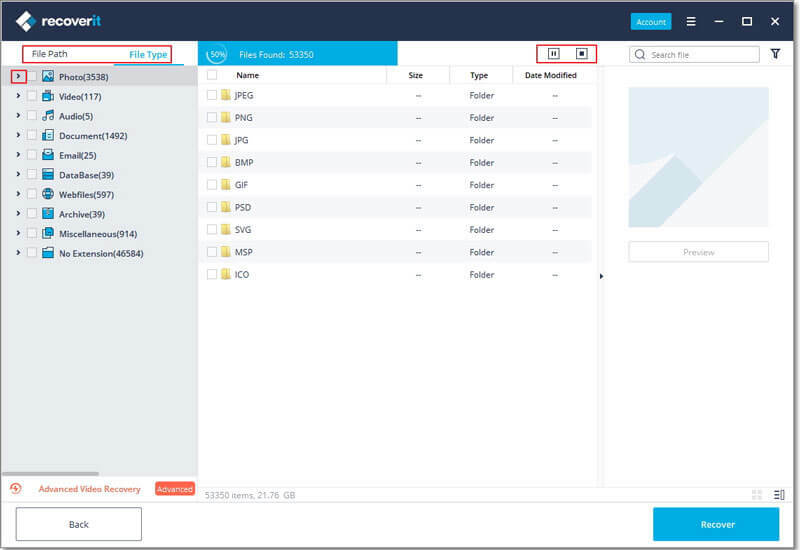 No matter files are lost because of accidental or intentional deletion, device formatting, system error or virus infection, iSkysoft Data Recovery recovers everything you need from computer and external drives. Important work file has been deleted from Windows computer by "Shift + Delete"? Previous photos are formatted from digital camera? Virus infection ruined the whole partition? Don't panic! iSkysoft Data Recovery provides the easiest, fastest and safest solution to recover data lost from different scenarios. No matter what data are deleted, iSkysoft Data Recovery provides a comprehensive data recovery solution to recover deleted files from a full range of devices. When we delete a file, we can still restore it from Recycle Bin. What if we've emptied the Recycle Bin, or just deleted the file by "Shift + Delete"? Don't worry. iSkysoft Data Recover can get these files back for you. Have formatted a disk and want to retrieve all the files? iSkysoft Data Recovery can help you recover lost files from formatted partitions in just a few minutes. No matter your partition is lost due to malware, data corruption, or disk management errors, iSkysoft provides the easy and safe data recovery solution to help you get all files back from lost partitions. iSkysoft Data Recovery not just recovers data from PC/Mac, but also from external drives, including external HDD, SSD, USB flash drive, SD card, etc. Virus or ransomware attacked your computer and prevents you from accessing your own files? iSkysoft helps you recover all files no matter it's affected by malware, Trojan horses, worm, or other virus. When the computer crashes, all files on the computer is unaccessable. iSkysoft Data Recovery provides a downloadble WinPE to help you reboot the computer and recover lost files from it easily. If the above quick recovery modes cannot help you restore lost data on Mac, this all-around Recovery mode gives you a complete yet in-depth scanning on computer and recover data. Equipped with the leading technology of data recovery, iSkysoft Data Recovery is able to recover almost all kinds of data from different devices. 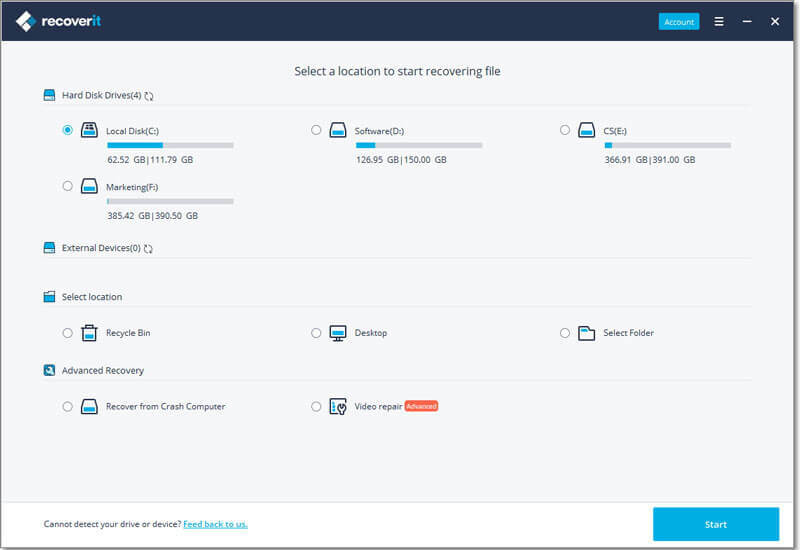 To improve the chances of successful data recovery, when you find your files lost, or disk corrupted, take immediate action and find a professional data recovery tool to get back the files. XLS/XLSX, DOC/DOCX, PPT/PPTX, HTML/HTM, PDF, INDD, EPS, CWK, VSD, ODT, ODP, ODS, ODG, ODF, RTF, etc. Supports to recover more than 100 document types, such as Microsoft office documents, Adobe PDF, InDesign documents, webpages, etc. PNG, JPG, TIFF, TIF, BMP, GIF, PSD, RAW, CRW, ARWCR2, NEF, ORF, RAF, SR2, MRW, DCR, DNG, ERF, AI, XCF, DWG, X3F, etc. Supports to recover lost photos in hundreds of major formats, no matter it's created by camera, saved by image editing software, etc. AVI, MOV, MP4, M4V, 3GP, 3G2, MKV, MXF, WMV, ASF, FLV, SWF, MPEG, MPG, RM(RMVB), etc. Losing a favoriate video isn't a pleasant experience. 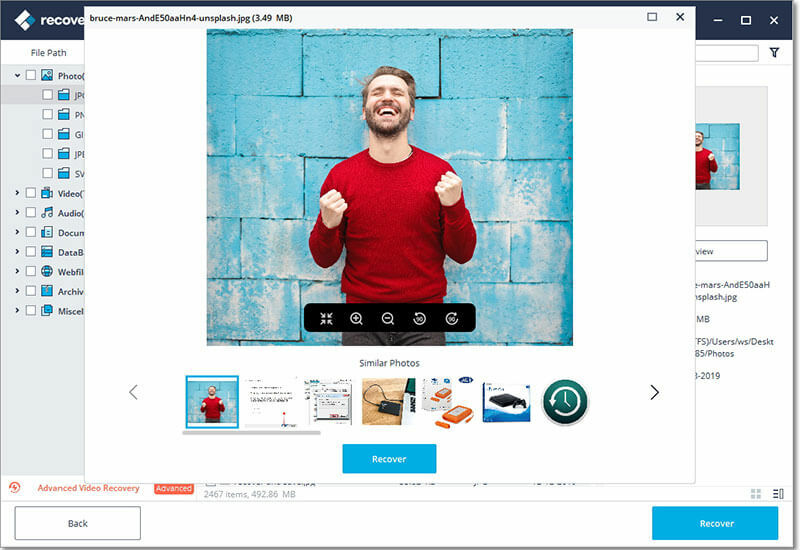 Get back all deleted, lost and formatted videos with the help of iSkysoft. EML, EMLX, PST, DBX, MSG, BKL, EDB, BKS, BMS, etc. Recover lost and deleted emails, no matter it's in Outlook, Gmail, Foxmail, or Thunderbird etc. Recover all major auido and music file types. Safe and effective auido recovery. ZIP, RAR, BZip2, 7z, SIT, SITX, DLL, SYS, LIB, 7ZIP, GZIP, etc. Recover hundreds of other file types, such as Zip files, from computer and other storage devices. iSkysoft Data Recovery is able to recover data from all types of storage devices with the file system NTFS, FAT16, FAT32 or exFAT are supported. When you find your files lost, do not try to repair the partition, or write new data to the partition/disk. All these actions might overwrite the lost files you need and make them unrecoverable. Computer crash often occurs when a software or operation system stops functioning and exit unexpectedly. 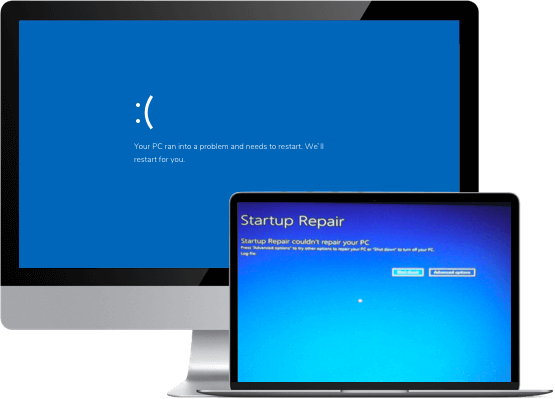 Windows PE, also known as Windows Preinstallation Environment, usually is used for system recovery when the computer doesn't start, has blue screen of death ,etc. With iSkysoft Data Recovery Ultimate, you can create a WinPE bootable media to help you access to the computer and get back all your vital files.You don't have to go through all the complicated process to reinstall windows system to recover your data. Just select "System Crash Recovery" mode, follow the intuitive instruction to recover your data from the crashed system. Step 1: Lauch iSkysoft Data Recovery and select the recovery mode according to your situation. Step 2: Let the program to scan the computer or external disk to find the data. The best part of this software is, it recovered my data which got cleared from the recycle bin too while formatting. While formatting my Mac I lost my essential data, iSkysoft shows the positive outcome to recover my files immediately. Accidentally deleted my images from Mac trash bin by clicking “Command + Delete”, but iSkysoft Data Recovery helped me to recover promptly. My essential work file got deleted without any backup from Windows due to "Shift + Delete", but iSkysoft helped me to recover it. Thanks! I formatted my external disk without noticing important photos were there. iSkysoft Data Recovery recovers all data back from this formatted drive. Lost my very important data from my Mac, but considering iSkysoft's Data recovery tool, I recovered all within a couple of minutes. Unable to install iOS 12? Here's The Real Fix! How to Fix iPhone Stuck on Apple Logo After iOS 12 Update?